Located in center of the parish of St James in Barbados, Holetown was the very first town ever to be built in Barbados and dates back to 1625. When the first British landed on the Island, they called the area Holetown as it reminded them of a stretch of the river Thames in London called the Lime house Hole. One of the oldest churches on the island is located in Holetown called St James Parish Church. It is believed to date back to 1660. Today it is a thriving and very pretty town located 2 minutes from the beach and it is full of lovely shops, restaurants, art galleries and bars. 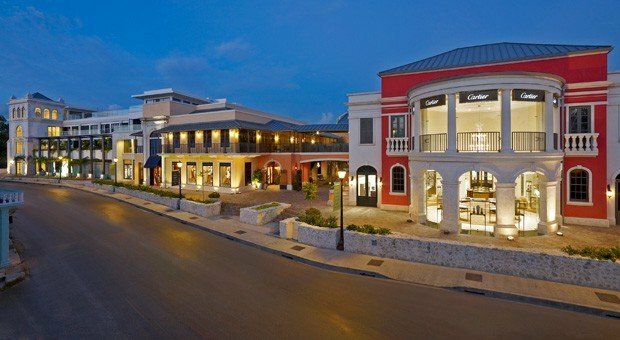 Located right in the center of Holetown, the Limegrove Shopping Center is a really beautiful open air mall full of exclusive shops and restaurants. It is Barbados’s first high end mall and features more than 100 of the world’s best fashion and designer brands. Many of the shops offer duty free prices and include well known brands such as Louis Vuitton, Michael Kors, Ralph Lauren, Longchamp, Burberry, Cartier, Hugo Boss and M.A.C. The Limegrove Lifestyle center also has a beautiful art gallery, cinema, spa, delicatessen and various coffee shops. One of our favorite restaurants in The Limegrove Center is Lemongrass which offers south-east Asian and oriental cuisine. Relish Epicurea is another really lovely casual option. Enjoy delicious Flying Fish and Avocado and Onion Salsa Bakes. If you want to enjoy some nightlife in Holetown then we would recommend you start your night at ‘Lime Bar’, enjoy a cocktail or two with friends in this open air bar. The atmosphere here is sophisticated yet offers low key elegance. Lime Bar also does some nice food during the day time and evening. The Lime Bar definitely offers a modern day approach to liming and regularly has live entertainment. Located right in the center of Holetown, The Chattel shops are a lovely collection of colorful chattel houses surrounded by beautiful tropical gardens. Here you will find a wonderful treasure trove of both designer and artistic fashion as well as a gourmet shop, home ware, gift items and arts and crafts items. Opposite Limegrove, are the two liveliest streets in Holetown for dining and entertainment called First and Second Street. Second Street in particular has a good selection of bars and restaurants. The Mews is a classic bistro and is a great place to enjoy some tapas. You can also come here to enjoy some wine, rum and cocktails at night-time. If you are looking for more nightlife then we would recommend the Red Door Lounge on Second Street which is a trendy nightclub and it is recommended you go at the weekends. It has a sophisticated urban vibe and offers excellent cocktails and tapas as well as great DJ sessions and live music. At the start of First Street you will find Nishi, a casual restaurant where you can enjoy excellent sushi. Just around the corner is one of the best Patisseries on the Island called Flindt Bistro and it offers delicious gourmet pastries available for eating in or take away. In addition some of the islands most popular restaurants and bars are located in the center or within a couple of minutes walk. If you are looking for a fine dining option, then a visit to Tides Restaurant is a must. Located directly on the sea at the water’s Edge Tides offers some of the best food on the island. If you fancy an early dinner, it is a wonderful place to watch the sunset. In addition there is a lovely art gallery featuring some well known Bajan and Caribbean artists. Here you will without a doubt find some of the best art and costume jewelry in Barbados. If you are looking for something more casual and some true Bajan cuisine we would recommend Jus’ Grillin restaurants. Here you can enjoy grillin shrimp, the best jerk chicken, delicious ribs and more. You can eat in by day or night and can also take away. Jus Grillin does the best Carrot Cake and Cheesecake! Another nice option if you don’t feel like cooking in your villa is to get a take-away from Zaccios, here you can enjoy homemade pizza, burgers, rotis and pastas. Another lovely option for lunch is The Beach House Restaurant and Bar. It is located just opposite The Beach House and beside Villas on The Beach. The food is excellent and being right on the water’s edge the location is also wonderful.